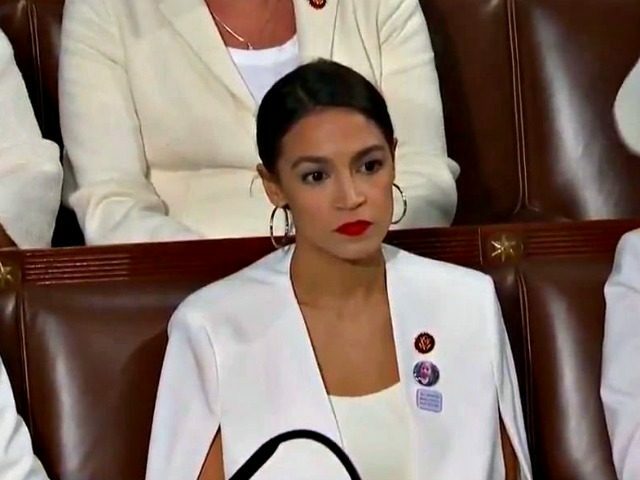 It proved to be one of the most chilling moments of the night, not only because it has to be said by a President of the United States of America, but also because Socialists like Alexandria Ocasio-Cortez (D-NY) was not alone in her scowl and refusal to clap, but the ENTIRE DEMOCRAT PARTY SCOWLED AND REFUSED TO APPLAUD in that moment! The President tried to throw fodder to the Democrats in his attempt to try and unify the nation and Congress. For example, he touted the economic successes of minority groups over the past few years, the growth of the middle class in America, winning the fight against opioids like Fentanyl, stopping the drug cartels and the child and human trafficking that leads to physical and sexual slavery of the youth, and stopping the murder of children who are born-alive, also called infanticide! Still, Democrats refused to clap or even smile in response to what should receive a standing ovation! Although throughout history, it has never had to be addressed by a President, and although if it had been said anytime throughout the history of our nation, it would have received thunderous applause! However, instead of unanimous and thunderous applause, it received a standing ovation and applause from Republicans, but the Democrats looked stone-faced angry, and refused to applaud! Therefore, in a brief moment, it revealed that every Democrat in attendance either fully embraced full-scale socialism and Marxism, or that the Party is now so much under the control of the radical Marxist wing of the Party, that all its members submit to their agenda, out of fear for their own political survival! Many are questioning how this could happen in a major political party within the United States, but there are several factors that have led to their conversion from proponents of a free and open market capitalist society which has led to the largest Middle Class in the world, into a political party that is pushing for an end to the freedoms we enjoy, with complete governmental control over ‘We the People’, and all forms of American wealth and economic prosperity and productivity! First of all, the Mainstream Media has become the mouthpiece of the Democrat Party, and has openly fought for Democrats to be in power by covering up scandals, burying comments that would turn off the American voter to Democrat candidates, and participated in wrongfully smearing the name and career of political opponents of the Socialist and Marxist Democrats. Secondly, our nation has in recent years seen our educational system taken over by radical Marxists, who have sugar-coated the history of Socialist and Marxist nations while demonizing Conservatives by projecting the Marxist’s history of racism, hate, and even Fascist Germany, onto Conservatives, despite Fascism truly being a Socialist ideology! After all, NAZI stood for “National Socialist German Workers Party”! Still, they have lied and projected their own hate onto Conservatives! Therefore, the Mainstream Media continues to assist the Democrat Party as it continues to attack President Trump’s agenda, declaring it racist. Already, Alexandria Ocasio-Cortez has promoted 100% renewable energy, and said that she wanted America to be rid of fossil fuels within a couple of years! Combine that with the fact that last week, Ocasio-Cortez predicted that global warming will end the world in 12 years, and a clearer picture begins to emerge. Cortez has now employed the most notorious weapon in the Marxist arsenal, and that is the use of fear, as a way to manipulate Americans into handing ‘We the People’s’ power over to the government, as Americans would be left with nothing except desperation, poverty, and servitude to a bloated and Elitist-run federal government! Never-the-less, Ocasio-Cortez and her now subservient Democrat Party are not only striving to confiscate Americans financial wealth and well-being, but at her behest, they are working to control the American people through their implementation of her Marxist “Green New Deal”, which will impoverish our nation, deplete Americans financial resources, and result in America transforming from one of the wealthiest and most powerful nations on earth, into to a mere third-world nation like Venezuela. Even when CNN asked Ocasio Cortez about how she planned to pay for and implement her 100% renewable pledge, she did not answer, but instead gave a jumbled and scattered answer that did not answer the question. Instead, she gave a rambling and incoherent answer. In other words, if Americans lose everything, and America becomes the next Venezuela, it shouldn’t matter! After all, Marxism is the only thing now that should matter, despite it being responsible for the genocide of countless millions of people, fear for those who dare oppose the Elitist rulers, racism and hate that it foments, and all in the name of being the “morally right” thing to do! Then, she said that in order to pay for her plans, she would skyrocket the corporate tax rate, which would net $2 Trillion, but that fails to account for the fact that it would also force prices to skyrocket on items Americans buy at their local grocery stores, Wal-Mart, and other stores, as ‘We the People’ are the ones who pay corporate taxes through the products we buy, NOT CORPORATIONS! In fact, CORPORATIONS DON’T PAY TAXES, ONLY CONSUMERS! In order to tax corporations, the government would have to charge taxes on income, not corporations! However, she plans to go after those as well! Keeping the flow of illegal immigrants streaming into the nation from third world nations, as they swell the welfare rolls, and bloat the pro-Socialist and Marxist voting rolls. Re-educate America’s youth to believe Marxism and Socialism is good, while freedom and capitalism is bad! Also, convince Americans that government knows what’s best for Americans, rather than Americans deciding for themselves! Ultimately, Representative Ocasio-Cortez has already vowed to destroy President Trump, used Marxist idealism to attack and demonize the Presidents supporters, and called the American people who oppose her agenda racists, anti-Semites, and hate-mongers, regardless of her being the one espousing hate, anti-Semitism, and racism! Now, she has even vowed to fight and destroy any remaining Democrats who oppose her Marxist ideology and agenda, and added on CBS’s Late Show with Stephen Colbert that she gives “zero” f*cks about the pushback she has received by challenging establishment Democrats! Sadly, Alexandria Ocasio-Cortez is the poster child of the Democrat Party of today, as they have moved swiftly from their Party’s original mission of ‘Classic Liberalism’ which had its primary emphasis being placed on securing the freedom of the individual by limiting the power of the government, toward its Marxist agenda of today. Therefore, they no longer are striving to secure ‘individual freedom’, but instead, squash it like a bug. Furthermore, they have strayed far from their original purpose of ‘limiting the power of government’, as they now seek to make it ‘all-powerful’, because, in their vision, they would like to see the United States of America transform into a Marxist State of tomorrow! To understand just how our nation has transitioned towards pro-Socialist notions within our society, you have to look back at its inception! In “Fabian-Economics: The True Backbone of the Anti-Trump ‘So-Called Conservative’ and ‘Progressive’ Resistance,” it describes the major influence that Fabian-Economics has had on the leadership throughout not only Great Britain, but the United States, and the world as a whole. The Fabian’s realized that to truly transform a nation, or the world as a whole, into a socialist ideology, they would need to take a new and different path. To understand Fabian-Economics and its socialist ties, you have to look at the various paths a nation can take towards the implementation of socialist ideology. The First path is through Marxist ideology (seen in the image above takes the path to the left) They believe in a mass international revolution of the working class. According to the Oxford Reference: Marxists believed socialism ought to come by international revolution. In fact, in 1848 Karl Marx and Frederich Engels called for the ‘workers of all countries to unite!’ They believed that communism would take root and spread like a virus throughout the world, and an International Communist Movement would take hold and rise up against the capitalist world. In the years to come, International Communist movements did sprout up, with the first opening in 1864 by Karl Marx himself. It was called ‘The International Working Men’s Association’. In 1876, Marx moved to New York and brought the organization to NYC. Then in 1889, the ‘Second International’ was founded and embraced both Marxist and Non-Marxist Socialists, but it failed to take off and ended in 1914 when WWI began. The third (Communist International) was founded in 1919, and died by 1943. During that time, the Soviet Union’s was born out of Marxist ideology as Vladimir Lenin embraced the revolutionary Marxism and led the 1917 Bolshevik Revolution. Lenin lived in exile prior to the 1917 revolution. However, under his leadership, the Bolshevik Party quickly consolidated power, while privatizing all areas of the Soviet economy. He was ruthless and cracked down on anyone who opposed him by sending out his secret police (called the Cheka). The Cheka instituted what came to be known as ‘Red Terror’, aimed at destroying anyone who opposed his power grab. As a result, the Russian Civil War broke out, until he obtained absolute power over the Soviet Union. Lenin’s ruthless reign was spent trying to shape the future of the Soviet Union, and he warned against unchecked power by Party Elites. However, his warnings went unheeded, and eventually, Joseph Stalin would take over as the leader following Lenin’s death in 1924. Joseph Stalin was a cunning and ruthless leader who took power officially in 1929. Under his leadership, Stalin turned the USSR into a mighty military superpower. However, during that same time, he instituted labor camps, execution squads, and became one of the greatest mass murderers in the 20th Century killing over an estimated 20 million of his own citizens. Anyone who opposed him became scared for not only their own life, but the lives of their spouse and children. The Soviets experimented with countries that were behind Iron Curtain after WWII, and under their iron fist. During that time they implemented international socialism with some Soviet States, and isolated socialism in others. They implemented whatever ideology in each State that they perceived to benefit the U.S.S.R.’s Elitist Political Class. Communism had a distinct number of faults that led it to collapse. It demonstrated a lack of creativity due to their Party not seeing art’s benefit for the collective, to artists and thinkers who didn’t conform to the Party’s viewpoint would face charges of high treason. Secondly, private farming was not allowed. The force collectivization law was a doctrine enforced through Soviet Russia between 1928 and 1940, which coincided with Stalin’s rise to power. During the Russian implementation of communism, private farms were conscripted into their collectivization program. Then, the food was distributed equally among the population. Anyone who resisted was eliminated through execution or re-education. The Chinese took similar actions against all those who opposed their rule. The third problem that led to the downfall of communist regimes was the lack of rights that individuals were allowed to have. Under communist rule, individuals had to surrender personal rights and freedoms to make room for ‘the collective.’ Citizens lost the freedom of speech since they were considered a danger to the Communist party, and the loss of private property, civil rights, or artistic expression took away some of the other basic human rights allotted to individuals. It was not important to think of what was best for each individual or family, but instead what is best for the collective whole. Furthermore, in communist societies, the needs of the collective began to give way to the needs of the political elite class. To make matters worse for communist countries, they were not able to adapt to outside global economic and social changes. China, was able to create a communist hybrid economy that was better able to react to outside stimuli, in addition to implementing corrupt and illegal practices like currency manipulation, unfair trade practices, breaking child labor laws, low wages, dangerous working conditions, etc. to out-price nations like the United States who have higher wages, and thousands of regulations on businesses. Countries like the Soviet Union were doomed from the start since they refused to react to the markets outside the borders of their nation. Another problem that communist countries faced was a lack of innovation. With communism being such a closed society, and innovation being the result of humans striving to create the newest and greatest invention to make their fortune, it makes communist innovation an impossible feat. To create an innovation that will benefit the communist elites, and not you or your family, it takes the motivation away for the individuals personal innovative drive. Furthermore, with a closed communist society, the collective is more focused on production than on actual innovation. To make matters worse under communism, poor economic calculation is another downfall of the ideology. Typically, the economy dictates that the price of a product is formed when the offer meets demand. However, under the communist doctrine, a command economy is the only way of determining how the resources are spent. This is where a huge disparity begins to show between the worker and the political elites. Political Elites tend to gain in wealth, power, and living conditions, while the average worker (proletariat) has little wealth, no power, rights, freedoms, and has poor living conditions. Another problem with communism stems from its blatant human rights abuses. With power held in the hands of the few, mass murder becomes just one of the tragedies of the communist regimes. From the rise of the Khmer Rouge in Cambodia to Stalin’s rise to power, the history of communism is riddled with tales of atrocities committed against those who did not embrace the communist doctrine. Communist regimes have been riddled with famine, overwork, child labor, mass executions, and other atrocities. Not to mention, the fact that a neurosurgeon makes the same as a factory worker, despite how difficult and long the schooling. Also, a worker on a farm making the same as a high-risk nuclear reactor worker would take away the incentive to work high-risk jobs. It takes away the incentives for people performing tougher or more dangerous jobs to be motivated to work harder or innovate. In all, Karl Marx’s communist utopian social experiment was doomed from the start. From its lack of rights, power in the hands of the political elite, obsessive control, and the many other problems, communism was a time bomb set to explode at any given moment. Combined with the reality that communism is founded on despotic regimes, founded on tyranny, who impose the use of terror and fear as tools to control the masses, it is an ideology wrought with problems. In the end, every society based on such oppressive, ruthless, and unbalanced leadership, rebels against such a regime. There is a second type of Socialism that is called Transformational or Nationalist Socialism (seen in the image above takes the path to the right) National Socialism (Nazism) is a totalitarian system that originated in Germany following the end of WWI. Some say it involved implementing a strong sense of nationalism, similar to communist USSR. It also implemented a dictatorial or draconian police state, brutal use of violence, disregard for human rights, and anti-Christian belief with the implementation of Darwinism. They used Darwin’s ‘Survival of the Fittest’ to justify the racial policy that subjugated or exterminated people based on the belief of being inferior. They included teachers or any other community leaders who might teach others and bring about rebellion against the Fascist leadership. The term ‘Nazi’ is a contraction of the full party name, ‘National Socialist German Workers’ Party. Nazism, in short, is simply one of several varieties of socialism. The Nazi Party controlled Germany from 1933-1945 under Adolf Hitler and resulted in World War II and the largest genocide against the Jewish people in history. The key to understanding National-Socialism or Fascism is in the fact that Fascists make it appear that private ownership of businesses remains, but in practice, it is merely a facade. In fact, according to the Misses Institute in Austria, the main difference between communism and national-socialism (fascism) is that the fascist’s “maintains private ownership of the means of production and keeps the appearance of ordinary prices, wages, and markets.” But in reality, the government directs production decisions, curbs entrepreneurship, and the labor market, and determines wages and interest rates by a central authority. “Market exchange is only a sham.” Therefore, Fascism is nothing more than another form of a Socialist System with the mere appearance of private ownership. Those privately owned businesses are subject to being taken and redistributed to someone else if the government so chooses. Therefore, it requires extensive government control of private property, businesses, and all other forms of possessions. In addition, just like communism, fascism forbids free speech, freedom of the press, freedom of religion, and all other forms of freedom that we take for granted in the United States of America today. Communist and Socialist supporters like to pretend that Fascism or Nazism was not socialist; however, the facts show that it is. College’s, Universities, and public schools have tried to cover up the truth behind fascism, and make American youth believe that it is ‘right-wing conservative.’ However, it’s very foundation is based on communist and socialist ideology. It would be like calling China a capitalist country, but it truly is not. The government owns all land and simply leases it out to investors. Business owners can lease property and run a business, but they are not free to do as they please. The government controls what they say, what they do, and all other aspects of daily life. Therefore, it falls far short of being a true capitalist country. China adopted this idea, likely from the fascist model of business. Fascism and communism both promote anti-Semitism. After all, anti-Semitism was advocated by the Father of Communism himself, Karl Marx. Today, America’s College’s and Universities don’t like to label Nazism as socialist. Instead, they try to paint it as “right-wing” conservative. However, Nazism was born out of the ‘Nationalist-Socialist” ideology; whereas, right-wing conservatism would fall into the category of anarchy. After all, the more conservative one is, the more they fight for the small government, hands-off approaches to business, less government involvement in the lives of its people, free speech, freedom of religion, and so forth. In fact, according to Merriam Webster, the definition of anarchy is the absence of government. A state of lawlessness or political disorder due to the absence of governmental authority. Therefore, conservatism is the opposite of Nazism or Nationalist-Socialism. Fabian Socialists believe in attaining the same goals as Marxist-Socialist, and Nationalist-Socialist ideology; however, they believe in getting there with a different method of achieving that end. Fabians realized that a revolt of the masses is next to impossible to achieve, except in the direst of conditions within a nation. That is why Fabian Socialists decided to devise a new method of implementing socialist ideology within a nation. This was especially true in the United States of America, where capitalism led to one of the greatest societies in the history of mankind. It led to a thriving middle class, while American’s were blessed with more freedom than any civilization in history. Fabians knew that a revolution of the working class was an impossible feat in a country like the United States. Therefore, American Socialists adopted the British Fabian-Economics model in an attempt to implement a socialist society in America quietly and under the radar of Americans. After all, Fabians believed in Socialism, but believed it would be better to gradually and quietly convert democratic society into socialist ones, rather than by Marxist revolt. Therefore, since the beginning of America’s Progressive movement, The pro-communist and pro-socialist leadership knew that transforming America from the pro-capitalist Constitutional Republic would require a much more secretive and gradual transformation than Marxist-Socialism or Transformational-Socialism could offer. It would require a quiet and gradual transformation that would slip under the radar of Americans. It would require the slow conversion of young minds to make them question the very fabric of our nation. To make them question the very freedom’s that they would come to take for granted. To make the youth envy the wealth that others had. Progressivism means proceeding step by step slowly, while passing the torch successively from one member to the next. Progressivism has been around for years in America, but took on its true pro-socialist form in the 1970s. During the Hippie generation, Progressives stayed out of the Vietnam war by going to college. They stayed in college to avoid and protest the war, and the movement began to quickly take root in our nation soon after. Progressive’s quickly graduated from America’s colleges and Universities, while others were educated overseas at Progressive Universities like London’s School of Economics. They pushed the Fabian-Economics agenda on the young and helped to influence the beginning of the Socialization of America. The young and easily susceptible students were revolutionized in a new and unique way. They began filling jobs throughout some of the most prestigious Universities throughout America like Harvard, Yale, University of Chicago, and so forth. Then, their new recruits would begin filling positions throughout State colleges, public school systems, government offices, church leadership, corporate leadership, scientific research facilities, and all other sectors of our national government and economy. It is ‘Fabian-Economics’ at work, and it is like cancer. Fabians knew that our children are the life-blood that keeps our nation growing. They knew that if they could infect America at its heart and soul, they could transform our nation away from the very thing that helped to make our nation great. The future of our businesses, corporations, and government. Progressive-Socialists or Fabian-Socialists didn’t stop there. They knew that they would need to erode the very thing that protects our country from the corruption and the perversion of mankind. They knew that to truly transform America, they would need to water down the Founding Fathers greatest achievement…’The Constitution of the United States.” In response to that need, Progressives or Fabians began the slow and gradual watering down and slow degradation of the glorious document. In fact, WND reported that under the Obama Administration, he illegally forced American’s to buy a product (healthcare) or they would be subject to a government penalty. A move that violated the constitutional rights of every American. Then, A federal judge said his funding for Obamacare was unconstitutional. Then Obama established a plan to illegally violate the 2nd Amendment and go after American’s who legally owned guns. Again, A court was told Obama’s gun-control plans “exceed the powers of the president.”President Obama then went after Christians and demanded that they are forced to violate their Christian rights under the Constitution by violating their belief that homosexuality is a sin. He demanded that they openly support homosexual weddings, which blatantly violates their freedom of religion. Obama went even further in stripping Christian American’s constitutional rights by forcing them to pay for the abortion pill for their employees. Fabians and Progressives have over the years had even worse implications on the Christian faith. They have infiltrated Christian seminaries; therefore, producing ministers who translate the bible, not based on scripture, but based on Fabian-Socialist and Progressive ideology. A move that can already be seen in churches around the world. It has had dire consequences in the Christian world and will have lasting implications in the coming years. Other areas that Progressive’s have used Fabian-Socialist philosophy to water down our constitution can be seen with Obama’s illegal and corrupt Iran deal, ignoring the law and refusing to deport illegal aliens, his amnesty deal, his mandate over private health records, his orders that schools and public buildings open women’s restrooms to men who claim to be women, his insistence that states cannot deprive abortionists of public funding, his insistence that the feds can order states not to enforce immigration laws, and his demanding that the federal government can simply change the definitions of words in federal law, even if it costs Americans. The Fabian influence can also be seen in that the Obama Administration and Democrats are giving the government the power to decide which people will be allowed to move into certain neighborhoods, deciding who faces prosecution, changing the Constitution’s language from: “freedom of religion” to “freedom of worship.”, dictating and changing the rules for ‘free speech’, and allowed the IRS to selectively target Christians and Conservatives because they disagree with Obama’s policies. To make matters worse, the Obama Administration made the Iran deal, which illegally traded our national uranium resources for cash that went to fund terrorists and kill American’s in incidents like the attack on our U.S. Embassy in Benghazi, Libya that cost the lives of our soldiers and Ambassador Stevens. Progressive Socialists pushed for Obama’s amnesty plan, which was illegal and circumvented the Constitution of the United States. Obama used taxpayer money to illegally bail out businesses, which is a blatant violation of his constitutional powers as President. However, because the political Elitist Progressive-Socialist Democrats and Fabian-Socialist Republican Establishment, there was nobody who would even consider stopping his unconstitutional acts. After all, Fabian and Progressive believed that the role of government should be determined not by our Constitution, but by whatever the needs of the day happened to be. That is why they have strived to eliminate any talk of the Constitution from political discussions today. They want American’s to follow their narrative, follow the Mainstream Media like sheep to the slaughter. Only, the Socialists strewn throughout our Political, Media, Hollywood, and Corporate Leadership today don’t want to slaughter, but instead control. Progressives knew that the Constitutional Republic of yesterday could never support all the new tasks required of a true Socialist or Communist State. Therefore, they have been creating a vast set of bureaucratic agencies. In addition, they have been creating an extensive set of broad, yet vague laws that would allow the supervision of more and more facets of our economy and society in general. Then, Fabian Progressive’s delegated bureaucratic agencies the powers to enact their agenda and policies. Meanwhile, Congress has authorized the Treasury to hand over trillions in taxpayers money to spend as these agencies saw fit. They handed over their Congressional authority to oversee how taxpayer money was being spent (power of the purse) to these (many times) unmonitored agencies. As a result, bureaucratic agencies gained the self-determination to decide what was in the public interest, spend and regulate, and in a nutshell become a un-monitored, un-regulated government. An organization that is separate from the government that is elected by ‘We the People’. An organization that serves one cause, and that is to go around the Constitution of the United States so it can implement a Socialist State. An organization that has now been called out for what it truly is…’THE DEEP STATE”. It doesn’t matter if you want to call them Progressive’s, Fabian’s, Socialists Democratic Socialists, Communists or Marxists! They are all cut from the same cloth. They all fight for the same goals. They all are fighting to implement the Fabian-Economist’s end-game, which is to implement a Socialist and Marxist State. Their ‘Deep State’ or ‘Administrative State’ government has grown to a massive size, and their goal to ‘fundamentally transform’ (as Obama put it) our nations democratic framework into a socialist state. A ‘Socialist State’ that was almost completely instituted under Obama in 2016. Their Deep State almost attained their goal to reorganize society by the emancipation of land and industrial capital from individual ownership, and redistributing that property to class or societal ownership. They swallowed up millions of Acres of private land to federal control under Obama. The IRS targeted Christians, and stripped away our Constitutional rights. The FBI and Justice Department targeted anyone who opposed the Obama Administration, and especially Progressive-Socialists, all while protecting and covering up Progressive’s actions. They placed Progressives throughout every bureaucratic agency in America. And in 2016, America reached the precipice of its demise. We reached a moment that would have become a nail in the coffin of our Constitutional Republic. A moment that would have re-defined our country. As Soviet Communist Vladimir Lenin stated: “The goal of Socialism is Communism”, and our nation came closer to communism that anyone could have imagined. THE BOTTOM LINE: FREE STUFF IS NEVER FREE! In fact, the only way to pay for such extraordinarily cost guzzling programs like what is being proposed by the Socialist Democrats today, is to create extraordinarily and astronomically high and financial burdening taxes on not only the wealth but on the middle classes and poor as well. In fact, it would create SUCH A BURDEN, it would cash strap families, bankrupt the American Middle Class, and effectively snuff out the American dream for today’s men and women, and for generations to come. Each of these premises has proven to make grave miscalculations, and Ocasio-Cortez is a prime example, as she like many of her predecessors fail to be able to explain how the failures of communism have always led to the wealthy elitists at the top while leaving everyone else in extreme poverty, and living in desperation and squalor. In fact, it destroys the middle class in its entirety, leaving the Political Elitists with immense wealth, and the majority of the population…EQUALLY DESTITUTE! After centuries of failed socialist regimes, socialists in all their forms strive to revise the reality of history, while replacing it with flowery, feel-good images that provide cover for socialism’s need to direct and control the social and economic actions of the many by an elitist few. THEY USE POLITICAL CORRECTNESS to hide their ideological falsehoods and deceptions while deeming anyone who opposes them RACISTS, BIGOTS, AND HATE MONGERS! The problem with socialists today is that they lack a basic understanding of human history, economics, and real-life principles, as historically socialism always leads to centralized power that is in the hands of an elite few, as freedoms are stripped away from the people, including life, liberties, and property. In the end, it strips away pride, the desire for excellence, and work ethic. Still, socialism’s true believers still believe that they have a moral right to impose their socioeconomic theories on the entire population, regardless of its cost in human lives, or the suffering it imposes, including the hundreds of millions of people who were slaughtered in the radical left’s former attempts to prove that socialism is the better way than that of freedom. Ironically, To say that socialism is devoted to the betterment of society is not simply a lie, it is an oxymoron, and the American educational system is the primary culprit for bestowing such a complete lack of common sense values and knowledge upon the youth of our nation. In fact, as elementary and secondary educational institutions have had their curriculum stripped down, as teachers hands became tied by bureaucratic guidelines and standardized tests, as colleges and universities stripped classical educational subjects of literacy, mathematics, and especially the brilliance of our Constitutional Republic away as well. Progressives have stripped the value of a good work ethic and the quality of work, and replaced it with equality of outcome in the workplace. Therefore, it doesn’t matter how hard you work, but instead that everyone is equal becomes the ultimate goal. Currently, it is easier to distort reality with the younger generations, because they have not had to live through socialism or communism. Furthermore, they didn’t have to see the horrors that a morbid and evil ideology brought about on entire civilizations of people. Socialism and communism tout equality, but it is one of the most unequal and ruthless systems ever devised by mankind. Sadly, our educational system has failed future generations by leading them to believe that in the theoretical benefits of socialism instead of its historical evil failures. Also, by teaching relativist theory that all systems of government are equally valid, and demonizing free markets, hard work, and free will, history is repeating itself again, not only in America but worldwide. Sadly, it highlights the failure of our educational system, being it has become infiltrated by radical Marxist Professors and Administrators! After all, water down and dumb down the educational system, and you can control the population! That is because it leaves the next generation of leaders with no understanding of history, no realization of the evils of Marxist and Socialist ideology, and no understanding of free-market economics at all! It is a serious problem, as America continues to be run by mis-educated Americans, who have a lack of understanding of the fundamentals and importance of our Constitutional Republic, or our Representative Democracy. Unfortunately for Americans, human beings have notoriously short-term memories, combined with the fact that Millennials make up almost 1/4 of the population in the United States. Therefore, most Americans either don’t remember, were never taught about, or were lied to by Marxist educators about the Soviet Union, Communist China, Fascist Germany, or other Marxist and Socialist horrors in history! Therefore, for anyone who knows how Marxists’ take over a free nation and society, it makes it a bit more understandable as to why the Democrats and Mainstream Media reacted to the State of the Union in such a dishonorable and disgusting manner! After all, they are filled with blind ignorance, hate, intolerance, and a loathing disgust for the freedom and liberties that the Constitution of the United States offers! However, at the same time, it also highlights just how crucially important the upcoming 2020 Congressional and Presidential election is for the American people! After all, the outcome will either lead to the freedom and prosperity under capitalism or oppression and servitude under Marxist-Socialism! Democrat MarxismDemocrats At 2019 State of the UnionDemocrats Embrace Socialism At SOTUDemocrats Fail To Applaud State of the UnionTrump State of the Union "America Will Never Be A Socialist Nation"
After study a few of the weblog posts in your web site now, and I really like your way of blogging. I bookmarked it to my bookmark web site checklist and shall be checking back soon. Pls try my website online as nicely and let me know what you think. Good post. I be taught something tougher on totally different blogs everyday. It can all the time be stimulating to learn content material from other writers and apply somewhat one thing from their store. I’d favor to use some with the content on my blog whether or not you don’t mind. Natually I’ll give you a hyperlink on your web blog. Thanks for sharing. Youre so cool! I dont suppose Ive read something like this before. So good to seek out someone with some authentic thoughts on this subject. realy thank you for starting this up. this web site is something that is wanted on the internet, someone with slightly originality. helpful job for bringing one thing new to the internet!